Cryptoparties Teach Attendees How To Stay Anonymous Online : All Tech Considered In these days of cyber intrigue, journalists, activists and ordinary citizens are interested in learning how to navigate the Internet anonymously. At cryptoparties, they learn how to do just that. Don't expect balloons and singing at a cryptoparty. Attendees are interested in being a bit on the quieter side. In an effort to foil corporations and governments collecting data, privacy advocates and political activists have been organizing cryptoparties since 2012, when the phenomenon began in Australia. The people involved in organizing and promoting cryptoparties say the presidential election spurred activists, journalists and everyday citizens to attend the get-togethers to learn how to anonymously use the Internet. One such organizer is a 27-year-old graduate student known as False Mirror. As you might expect from someone who fears government snooping, he asked not to use his given name in order to protect his privacy. "I think before the election, there was very little interest by most people about digital security," he said. "Even in activist spaces, people had very much an attitude of, 'Well, I'm not hiding anything' and 'The cops can see me sharing cat memes or whatever.' 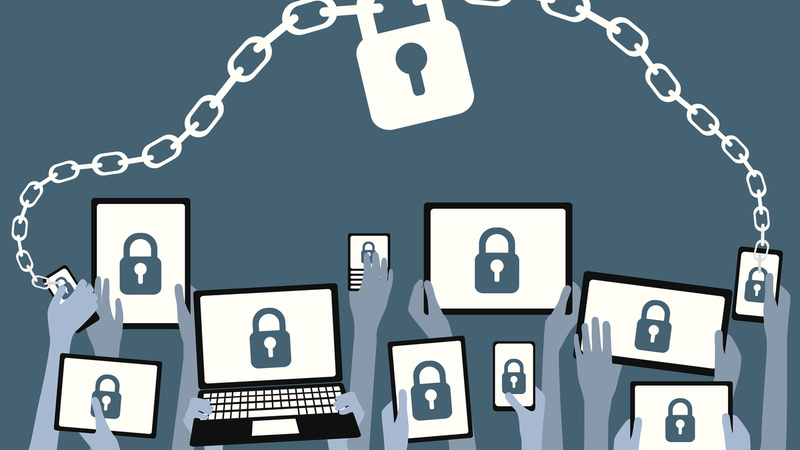 "
A Year After San Bernardino And Apple-FBI, Where Are We On Encryption? People did not really value their privacy, he said. But that might be changing. Matt Mitchell, a security researcher who runs a monthly cryptoparty in Harlem, teaches people about so-called circumvention technologies. "Anything from the Signal app, which allows you to use data instead of cell towers to make voice calls and send text messages, to Tor browser, which allows you to browse the Internet and no one know that it's you," Mitchell said. "They don't know where you are; they don't know who you are." At the office of Verso Books in Brooklyn, about 100 people turned out for a recent cryptoparty. One of the presenters was Harlo Holmes, the director of newsroom digital security for the Freedom of the Press Foundation, a nonprofit dedicated to defending public interest journalism. "Cryptoparties have always been a kind of refuge for people who need to take control of what they use," she said. Participants are encouraged to bring their laptops. At this gathering, groups of 10 to 20 people sat in circles to focus on such areas as dating apps and encrypted email. Bex Hurwitz led a group discussing contacts kept on smartphones. "One thing that we might think about is how much information is stored on the phone itself," Hurwitz said. "Make a smaller digital trail behind us, and keep a smaller digital pile in our pockets. It's also possible to store data about contacts somewhere off your phone." Another Brooklyn crypto gathering took place at an anarchist community center filled with funky furnishings and posters for various left-wing causes. Members of the NYC Crypto Squad met to organize a rather analog project — a zine focused on crypto issues. Amy Ciavolino was one of the two female software engineers in attendance who created a new website called "So We Hear You Want to Fight the State?" The site offers tutorials on password managers, an alternative search engine and phone pass codes, which they say is handy if you don't want the cops to know about your anarcho-syndicalist knitting group. "With the election, there's a lot more people thinking about activism and security around that," Ciavolino said. "And a lot of the tutorials and things are not friendly. They're kind of hard to consume. So we wanted to make one that was friendly and fun." Mitchell said both the tools and attitudes surrounding these crypto issues are evolving. "I never thought I'd see a day where there'd be a security section of your phone," he said. "I never thought there'd be a day where it's an encrypt area of your phone, a privacy section of your phone. But people started asking for it after a lot of news stories, after a lot of revelations." Some in law enforcement, including FBI Director James Comey, have raised concerns about strong encryption. Comey says it will hurt public safety, particularly in the battle against ISIS, whose operatives, he says, increasingly use encrypted messaging apps. These issues of privacy and security are likely to be debated at a cryptoparty near you. You can follow Jon Kalish @kalishjon and visit his website.